Volleyball Officials Who Are They And What Do They Do? 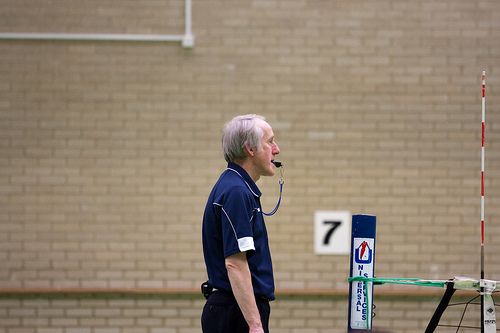 Volleyball Referees, Linesmen and Scorers what are their responsibilities? 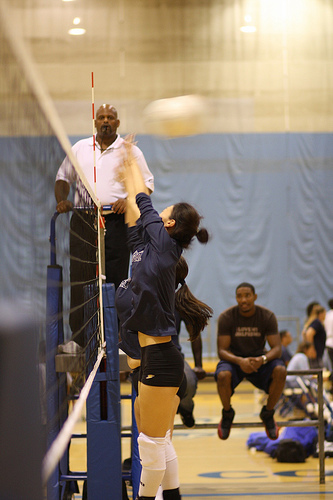 In competitive matches, volleyball officials are responsible for officiating the two teams competing against each other. Officials: First referee calls the game from an elevated referee stand while officiating the two teams competing against each other. Volleyball officials at the school, club, national, and international level for matches all have officials responsible for refereeing the match, keeping score and watching the court during rallies to observe, moderate and determine which of the two teams wins and making sure both teams compete fairly by following official volleyball rules. Let's review the job descriptions, responsibilities and the roles of the volleyball officials and referees and others who may be officiating your next game on. Why is knowing this information important? The referee and other non-playing officials on the court have a say in what happens during a game you are competing in. Sometimes volleyball players agree with them, and lots of times players don't. Many times, players and coaches will compete in a tournament where they may know how to interpret a rule better than one of the referees officiating the game. Knowing what the officials job responsibilities are can help you win a few arguments should the occasion arise. Below, I've described the responsibilities of the volleyball referees and the people they work with. 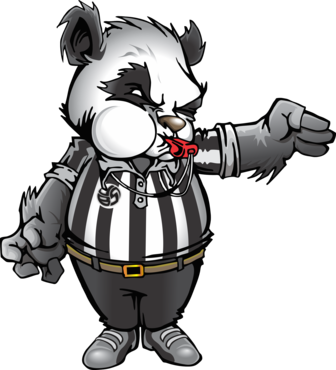 The first referee, aka the first official aka the 'up" referee starts the match, judges each play and calls the technical fouls, assigns points and sideouts as they occur to each qualifying team and also makes the final decision on questionable plays. He or she is called the "up" referee because they climb up and call the game from an elevated volleyball stand. Volleyball officials: First referee waits while an injured players gets attended to. The first referee watches the blockers for net touches, calls the double hits, lifts, technical fouls, timeouts and starts each play with a whistle blow to each server. the first referee inspects the balls, the court equipment like the net and antennae and inspects the conditions of the playing area. 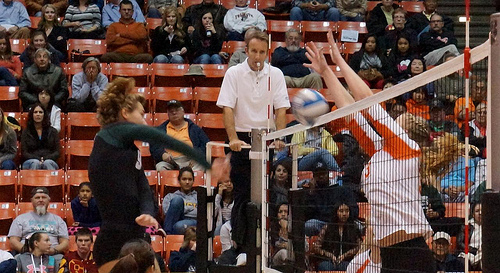 attack hit faults committed by the Libero if they jump and attack the ball making contact when the entire ball is above the level of the net. Volleyball Officials: What's a Second Referee? The second referee is across from the first referee on the opposite side of the net officiating the game from the ground. The second referee, one of the volleyball officials, sometimes known as the "down" referee assists and supports the first referee mainly by calling fouls that occur under the net. d) also looks to the linesman for judgment calls when needed. They also watch players on team benches who are in the warmup area, controls and helps monitor both team's timeouts, communicates with the scorer at the score table. At the beginning of matches and at the beginning of each set, the second referee checks each team's rotation based on how each coach has entered their starting lineup on the lineup sheet. Volleyball Officials: What's a Scorer? The scorer operates their functions from a table, the scorer's table which is located behind the second referee. Volleyball officials:The first referee watches the blockers for net touches, calls the double hits, lifts, technical fouls, timeouts and starts each play with a whistle blow to each server. if there are any protests launched during the match, the scorer, with permission from the first referee will allow the captain of the team launching the protest, to write the details of their protest on the score sheet in a statement regarding the incident. Volleyball Officials: What's a Linesman? Depending on what type of game is being played, there are two or four linesmen that stand on only two or all four corners of the volleyball court. When there are two official linesmen one stands at the corner where the sideline and the service line meet on one side and the other linesman stands in the same place on the opposing team's side. In official games, the linesmen will have a flag in their hands, if not, then they will make their calls using their arms. Their responsibility is to judge whether a volleyball has landed inside or outside of the sidelines or service lines and to call any block touches. Learn more about the Referees and Officials. Or visit the pages in the Rulessection in the drop down menu at the top of the page.